"Goma" is sesame in English. Origin of this name from that it is like sprinkled sesame. "Gomasuri” printing does not use the paste. 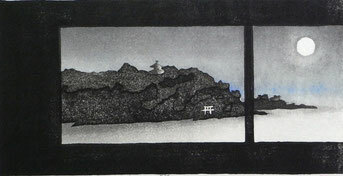 It is printed only with water and pigment. The sesame will be coarse by much water, will be small by a little bit water. I print blocks of B and C' by "Gomasuri”printing. First, dampen to the plate surface by giving a little bit water. I put the black-pigment on the block surface. I decided to wipe part of the block with towel, to acquire the light and shade. I printed it by light pressure. Then wiped portion will be gradation. I dry this print for a day. 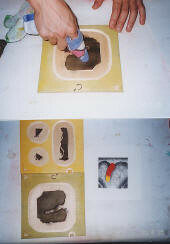 Even if printing on the dry "Gomasuri”print, the color will be not mix. This has the effect of giving a deep look into the work. 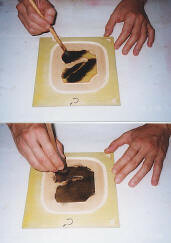 Sesame printing"Goasuri” of the island part in these three works was printed by controlling the amount of water and pigment. As the amount of water is reduced, sesame will be fine. As the amount of water increases, sesame will be rough.